Territory and Municipal Services is reminding Canberrans that today is the last day to provide feedback on the proposed Lyneham food forest, to be located behind Lyneham Primary School. If the food forest goes ahead, local volunteers will work alongside TAMS to plant around 30 fruit and nut trees, as well as complimentary plants, over several years. In 2014 a group of Lyneham residents approached Territory and Municipal Services (TAMS) with a request to transform a small piece of low use public land in their suburb into a food forest for the benefit of the surrounding community. TAMS investigated the request and found the site suitable for a food forest pending wider public support for the proposal. 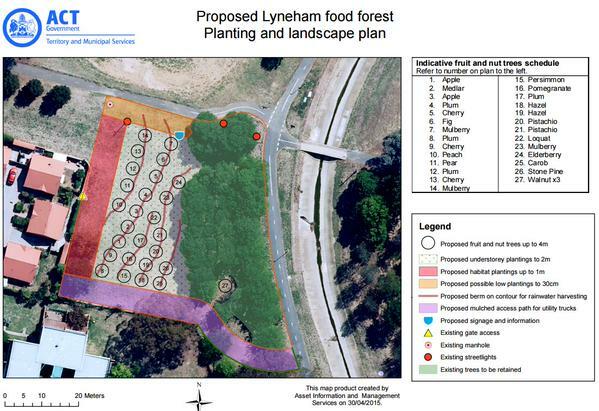 To have your say on the proposed Lyneham food forest, complete the feedback form before 5pm today (Monday 15 June 2015). Great idea. Kudos to Lyneham’s residents for making something cool like this happen. Here’s hoping it goes ahead, is successful and that similar projects can be rolled out in Canberra’s south. On behalf of the usuals I’ll jump and object to the ugly trees. This land be far better used for a car park! Where is the business benefits study? Unless of course it is to be used for car parking, in which case none necessary. And someone has to point out the dangers of climbing the trees to put the stickers on the fruit. Its a good idea. 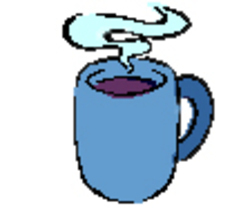 Hope some other parts of the community could do likewise. Have they planned for the need to pick up fruit off the ground – a legal pest-control requirement for owners of fruit trees? Who is going to take responsibility? I doubt much of the fruit or nut harvest will have time to lurk around on the ground. Some voracious, chook-owning, foragers in Lyneham. The European wasp plagues in Canberra love fallen fruit. What a lovely idea. I am someone who picks ‘feral’ fruit and bottles it, also makes jams and sauces from it, as well as eating the fruit fresh and cooking the fruit in pies, etc. Last year for the first time I also bottled grape juice. I have many shelves in my pantry lined with jars and bottles. I have now planted over twenty trees, bushes and vines, so I will have a closer to hand source of fruit. To those who worry about the fallen fruit, if there are any left over to fall, this is no different to the streets planted with flowering fruit trees now. The fruit that is left on those after people like me have picked what we can use, falls to the ground and doesn’t appear to cause a problem.